Will Schermerhorn's previous DVD covering the first 18 months has proved invaluable to both parents and professionals and as a follow-up the author has now produced another resource to cover the next phase of childhood, which promises to be equally as beneficial. The DVD, Kids with Down Syndrome Staying Healthy and Making Friends (120 minutes) focuses on development from early childhood through to adolescence, highlighting many key areas of development. This DVD has commentary from parents and professionals from around the world, as well as motivating clips from children, adolescents and young adults with Down syndrome. Section One - Staying Healthy includes practical advice and real-life scenarios from parents and professionals on topics such as potty training, nutrition, hearing and the ear, sleep issues, getting exercise and therapeutic horse riding. Section Two - Making Friends focuses on social information such as first steps to independence, building conversation skills, friendships, behaviour and life with Down syndrome. At the end of each section there are very helpful bullet-points that help consolidate the key information presented within the section. Also in each section, there are 'Life Stories' from parents and young adults, who share their life experiences about health and social issues. The young adults talk candidly about their experiences growing up with Down syndrome, life at school and 'finding-out' they had Down syndrome. A very helpful 'extra' on the DVD is a section called 'Making sense of research'. Many of the watchers will have limited experience of reading research, and this section explains in clear language what important points to look for in research studies, how to interpret results, and basic statistics and their meanings. It's a very useful section for those people who have limited experience with research information. 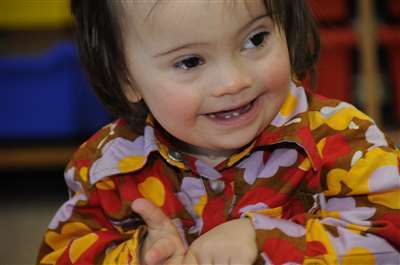 This DVD provides yet another valuable resource for parents and professionals working with children with Down syndrome. The information presented is very practical and the 'real-life' examples help the watcher feel more able to implement the information and advice given.